You never quite know what you're going to get at Haleiwa. It could be huge and scary. It could be small and playful. Whatever cards the Pacific deals this year, with 10,000 end-of-the-year QS points on the line, the Hawaiian Pro is a critical opportunity to end the year on a high note. Over the years, some surfers have seen their dreams of Championship Tour dashed on the reef at Haleiwa, while others have risen to the occasion and defined themselves. From the aerial antics of Griffin Colapintoin 2016 to Dane Reynolds' impossible layback in 2012, success at Haleiwa is often predicated by surfing on the razor's edge of success and disaster. Needing a 5-point score to advance out of Round 3, with no time on the clock, Colapinto went for broke. Lofting a tail-high, inverted air reverse into the trade winds. Coming down in the flats, he was momentarily buried by the whitewater, but cleanly rode out. The judges gave him a near-perfect 9.93 for the one-maneuver ride. He shot from third to first, turned the heat and went on to make the Quarterfinals. "That is one of the most exciting finishes I've ever seen at Haleiwa," said Ross Williams on the webcast. Grow up surfing on the North Shore, Williams has certainly seen what's possible at Haleiwa. The following year Colapinto would come back to Hawaii, win the Triple Crown title and qualify for the CT. Currently ranked No. 20 in the world, he's also ranked No. 3 on the QS and backed up for qualifying for the 2019 CT season. In 2015, Wade Carmichael was a relative unknown from Avoca Beach, New South Wales. A talented, blue-collar surfer who hammered the rail game, he brought his timeless approach to Haleiwa and came away with a career-changing victory. Beating Filipe Toledo, Ezekiel Lau and Dusty Payne in the Final, it was the break he needed to eventually get on Tour. "I don't even know what to say," stammered Carmichael after learning he'd won the first jewel of the Triple Crown. "I'm just freaking out." Just like Colapinto, Carmichael would qualify for the CT the following year. Ranked No. 7 in the world going into Hawaii, he fronts the race for Rookie of the Year. Barreling into the 2014 Triple Crown, Dusty Payne wasn't even in the conversation for qualifying for the CT via the QS, but with two 10,000-point events in his backyard, he got to work. 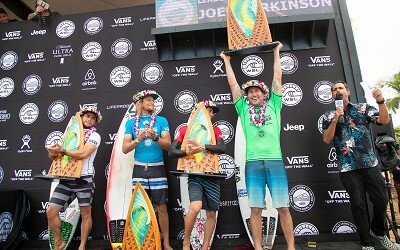 Winning the Hawaiian Pro on the merits of his aerial approach, all of a sudden he was back up in the mix. Another result at Sunset assured him a spot on Tour in 2015. "It's always been a dream of mine to win here since I watched Andy win," said Payne afterwards. "We just surfed epic Haleiwa for four days straight. What more can I say. I just want to have fun and keep surfing. This is the greatest job in the world." In one of the most inspiring comeback stories in surfing, after sustaining a life-threatening injury while surfing Pipeline last January, Payne has spent the year recovering and is now back in fighting form and ready for the Triple Crown. The maneuver by which all other maneuvers at Haleiwa will forever be judged. In 2012, Dane Reynoldsthrew himself at an oncoming close-out section. Laying back into the turn, he blew the fins out, lost the board in the lip, then disappeared in the whitewater. Somehow finding his feet, he eventually emerged and rode out of it. Jaws across the North Shore and on webcasts around the world collectively dropped. "That might be one of the best turns I've seen in my whole life," said Shane Dorian, who was commentating the webcast with Rob Machado at the time. The 2008 Hawaiian Pro proved to be one of the most challenging in recent years. With a bombing swell during the early rounds, there was no shortage of beatings, but they were also the kind of challenging conditions a Tahitian kid nicknamed "The Spartan" thrived in. By the end of the waiting period the waves were as good as they get at Haleiwa and Michel Bourez had announced his assertion on the world stage. "This is definitely the best moment of my life," said Bourez at the time. He dedicated the win to fallen Tahitian Malik Joyeux, who died surfing Pipeline in 2006.